A while back, I received an email from a reader who is going back to school for an engineering degree. He asked me to write a detailed post on why I gave up my engineering career. Engineering is a great field to get into. These STEM (Science, Technology, Engineering, and Math) careers pay well and the world demands more engineers every day. However, an engineering career might not be a good fit for everyone. 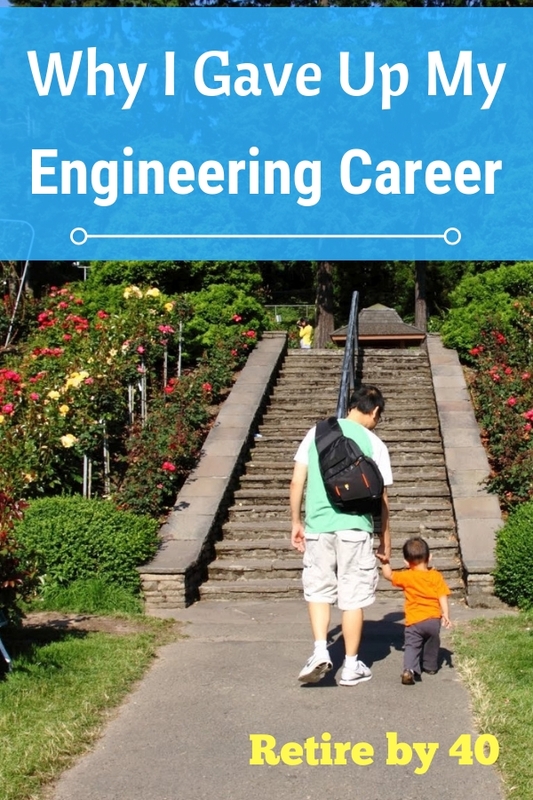 I enjoyed being an engineer, but I quit my job in 2012 to become a stay-at-home dad/blogger. Why did I make such a drastic change? I’ll share my experience with you today. *This post was originally written in 2013. I’ve updated and expanded it to be more useful. I added my experience since I left the field and my hope for our son at the end. The comments on this post are excellent too. Check them out after the main post. I hope you enjoy this one. Computers fascinated me when I was young. The first computer I interacted with was my uncle’s monochrome PC clone. (I don’t even know what it was.) He set me up with a Defender like game and I was hooked. Prior to that, the only experience I had with a screen was a TV. Even a TV was rare in Thailand when I was a kid. My aunt had a TV and the whole neighborhood would cram into the living room to watch the single available channel. It’s a different world today for kids with their tablets and smartphones. That’s lifestyle inflation for ya. Anyway, I tried to learn more about computers at every opportunity. I liked it because it was all about logic. You put something in and you consistently get the same thing out. When I graduated high school, I decided to major in Electrical and Computer Engineering (ECE.) Studying engineering was a difficult ordeal. Many students couldn’t get through the first year. The difference in difficulty between high school and the university was too much for lots of people. One of my college roommates was the smartest kid at his high school and he really struggled in college. (Granted, it was a high school in South Central LA, but still…) Once we got through that difficult freshman year, everyone was able to complete their Bachelor’s degree. Luckily, my alma mater offered a 5 year BS/MS program. Students could take graduate level courses during their senior year and shorten the time to complete the Master’s degree. I did this and also received some credits for being a Teaching Assistant. The upshot is I got an MS in just one more year and was able to find a job relatively easily. I think this MS/BS combo program was a great idea. It only took one additional year and I stood out from all the other new grads with just a BS degree. I got a job right out of college with Intel, a great tech company. The dot-com boom was on the upswing and computer engineers were in high demand. I studied chip design so working for Intel was a dream came true. I worked on the memory (DRAM) interface and learned a ton about how the computer chips were made. The first 7-8 years at Intel was great for me. I excelled at the technical side of the job and was promoted every few years. The workload was pretty crazy and young engineers routinely worked 50-60 hours per week. Occasionally, we’d work long stretches of 80+ hour weeks when the chips came back from the Fab. The job was still fun because I was learning a ton of stuff and had many friends at work. To me, this was the best period as an engineer. I enjoyed solving technical problems and didn’t have to worry about any of the corporate politics. If I could have stayed at this level, I probably would still be an engineer. Ah, good times. After 10+ years as an engineer, the expectation changed drastically. The company expected different skills from their senior engineers. At the entry and midlevel, it was enough to excel at the technical side. However, the company wants their senior engineers to lead and work through others. You have to be a multiplier when you’re a senior level engineer. Being good technically was no longer enough. I was a terrible leader and things just didn’t work out well when I tried to be a manager. I was too laid back and I hated telling people what to do. Do your damn job. Why are you asking me what to do? As I said, I’m terrible at managing people. The job was no longer a good fit for me and that ’s the biggest reason why I left engineering. I am not a good multiplier. There were other factors as well. I got married and didn’t want to work long hours very often. Once we had a kid, I rarely worked late or weekend unless I really had to. This didn’t compare favorably with single engineers who enjoy working until 10 pm. Those Putzes need to read this blog! More and more time was spent on technical writing, planning, presentations, meetings, classes, etc… I liked the technical side of engineering and I loved working in the lab. The other stuff wasn’t important to me and consequently, I didn’t put much effort into them. That’s the wrong move if you want to stay employed. I felt the work was inconsequential. I was just a cog in the wheel and anyone can replace me. Most people don’t really care how fast a computer runs these days. Computers will keep improving with or without me. The job was not meaningful to me anymore. I lost interest in the job/career. I’m not sure why, but I’m not really interested in computers anymore. My $400 laptop works well enough and I, like most regular people, don’t really care about the next snazzy upgrade. I don’t even play video games anymore. The paycheck was the only thing that kept me going into the office. My physical and mental health deteriorated due to the sedentary lifestyle and stress. Many of my friends left the company or were laid off. My old boss was fired a few days before Christmas in 2009. That made him ineligible for the year-end bonus because you have to be on the payroll through December 31st. I thought that was pretty heartless. I knew it was only a matter of time then. Senior engineers will be targeted for layoffs at the first whiff of an economic downturn. They make too much money and don’t work as hard as young engineers. It is also difficult to find a job as a senior engineer. Lots of senior engineers will be laid off around the same time and everyone will be looking for a job. Lastly, I wanted to try something new. Being a SAHD/blogger is a big departure from being an engineer. I figured if it didn’t work, I’d go back to work within a year. Fortunately, it worked out even better than I imagined. I don’t think there is any way to know if an engineering career is right for you unless you try it out. Most of my engineer friends from college are still in the field, but only a few are doing the technical work. One guy is still working in chip design and loves his job. He works for a small company, though. I think that makes a big difference. In a big company, anyone is imminently replaceable and they don’t really appreciate you. It’s all about the bottom line and you’re just a resource. I believe the camaraderie makes engineering much better in a small company. I’m sure many senior level engineers are happy with their jobs and still enjoy their time at work. Also, lots of people successfully made the transition from engineering to marketing, managing, training, or other peripheral jobs. However, engineering was not the right fit for me anymore. Luckily, I saved and invested diligently since I started working. Financial independence enabled me to become a stay-at-home dad and take care of our son when he was a baby. I may rejoin the workforce someday, but I’m 100% sure I will never go back to engineering. It’s too late anyway. My technical skills are outdated now. It’s been over 6 years since I quit my engineering career. Life has been incredibly good for me. I spent a ton of time with our son when he was young. I’ll always be grateful for that. Now that he’s going to school full time, I can spend more time on Retire by 40. I really enjoyed that time with my son, but I’m glad he’s growing up too. Did I miss engineering? No, not at all. I haven’t done anything related engineering since I left in 2012. I don’t miss programing, designing, debugging, or any other engineering tasks. These days, my plate is full with being a dad and a personal finance blogger. Personal finance is still fascinating to me. It might lose its luster at some point, but I’m enjoying it right now. There are some new challenges ahead, though. My mom is struggling with dementia. It is a stressful time for us. We’ll just have to stay positive and deal with it the best we could. Actually, it’s a good thing that I’m not an engineer anymore. I couldn’t work full-time and take care of my mom. *Starting a blog is a great way to save money on your therapy bill, build your brand, and generate some extra income. Check out my handy tutorial if you’re thinking about blogging – How to Start A Blog and Why You Should. Our son, RB40Jr, is only in 2nd grade, but it looks like he’ll be good with math. He’s ahead of the class in math and reading. His writing is atrocious, though. This is very similar to my development curve when I was young. If he continues to excel at math, he’ll probably be steered into STEM at some point. Would I encourage him to pursue a career in STEM? Yes, I think it’s a better idea than being a blogger. The world needs more engineers in the future. If he likes it, then he should go for it. I’d make him read this post and the comments, though. It’s a cautionary tale. An engineer needs to evolve. It isn’t enough to excel on the technical side of engineering. Eventually, an engineer will need to adapt and take on a different role. The key is to save and invest as soon as you can. Financial independence will give you more choices. I hope this answer some questions for readers with aspirations in engineering. A big company like Intel has a lot of corporate BS to deal with. I probably should have left 5 years earlier to join a small company. The timing just was never right. Anyway, let me know if I can answer any questions. Don’t forget to check out the comments to see more diverse views. I’m not the only one that thinks this way. If you are a senior level engineer, do you still enjoy your job and will you continue with it until full retirement age? Everyone who is thinking about quitting their job should read Financial Samurai’s book: How to engineer your layoff. Why engineers should plan for an early retirement. I would have saved myself a lot of grief if I read this at the beginning of my engineer career. More on how I’m doing after leaving engineering – 6 years after early retirement. The post Why I Gave Up My Engineering Career appeared first on Retire by 40.